1. A great staff is made up of “great” leaders. Leaders that ask the question, “How can I help”? 2. Best practices for creating a “Great” staff. a. Do for ONE when you can’t do for all. LOVED this point. I’ve been involved on teams that the leader would say….well, If I can’t do it for all…I won’t do for any. OK, that’s fine for them….but what about that one person who really needed what they had to give them? As leaders, we need to ask….what is the ONE thing that this ONE person needs from me? b. Systematize top down service. Random acts of kindness is not enough. If you want your team to serve…make sure they see you serving. be intentional. One thing that NP does is assign all team members to a “staff coach”. This is an older member of the team who will help develop the person of the team members. The team member can bring anything to this coach to get perspective. Great idea…especially for larger staffs. d. Create and maintain a sustainable pace. Withough margin, there is no room to serve. Without margin, we seek first OUR kingdom. e. Celbrate and reward greatness when you see it. What’s rewarded is repeated! That is so good! Andy paused and reflected on one talk he’s developing right now….Symbolic Leadership – I’m going to do for one what I wish I could do for all. I really like the title…Symbolic Leadership. Where could we go with that? f. Confront your ego. What’s more important: Creating a great organization or creating a name for yourself? Ouch! 3. Signs that things aren’t so “great”. One thing NP does is stop at the beginnning of some staff meeings and write one thank you note. Great idea. Wrapped up the session – went on road trip to Brownsbridge – Had outside BBQ – did a quick starbucks run – then came back to hear the Bethany Dillon bluegrass group (not my music style but I can acknowledge the talent). Then….Jeff Foxworthy. Yes he was very funny. Great christian guy! After Session 1 of Drive we met up with a bunch of bloggers who track with Carlos at Ragamuffin soul. It was quite a fun/interesting gathering. Great people. Nice meeting some of the people who I’ve followed in the blog world. Especailly enjoyed connecting with carlos & Heather….Reid, Brad, & Pete. Great time had by all. Thanks los for organizing our gathering and inspiring us to blog. I’m the hovering head in the row right in front of the back row on the right side. 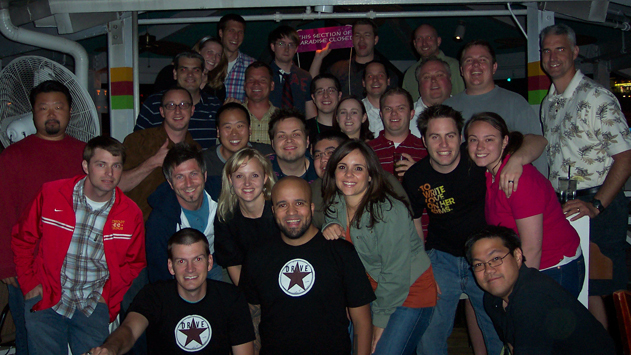 When was the last time you met 30 good friends for the first time? Tonight opened up with the band & Steve Fee performing a cool song (I think it’s called Typical). Then Andy came up and set up expectations for the event. Cute video about church staff road trip then into Andy. Once again, Andy did a great job presenting a topic that for some will be brand new and others might be a topic they’ve already studied. I thoroughly enjoyed it. As leaders we need to choose to Trust and be Trustworthy. I liked the way that Andy is able to speak for the senior leader to the staff and share some tough statements that staff might likely hear better and let it sink deeper coming from Andy at a conference as opposed to their own senior leader. Our leaders need to trust us: When the senior leader finds the gap between what they expect and experience…they need to trust. When there is suspicion, they need to trust. When trust is eroded, they need to come directly to us. We need to be trustworthy: We need to do what we say and when we don’t…we need to tell our leader. We need to not over promise and under deliver…but, if it looks like we’re headed that way…we need to tell our leader. And, if we’re confronted about the gaps we create…we need to tell the truth. When we tell the truth and go directly to our leader with and issue…we will build confidence. Final Question…..nail in the coffin…. “Are the relationships on your staff worth exporting to your congregation”? or How will you feel when you see the people in you congregation building relationships like the relationship on your staff? Session ended with a powerful worship set led by Steve Fee, Eddie Kirkland, Kristian Stanfill, & Todd Fields with back up by Candi Pearson-Shelton. Now that’s a powerful line-up. All this while the Jesus Painter is doing his thing. Deep, powerful, emotional, moving, celebration, communion, love, and thankfulness. As a leader, do you trust your team? As a team member, are you trustworthy? Ragamuffinsoul is more than just a blog! This is my buddy Carlos from here. If you’re not really into blogging…read his first and you’ll quickly think blogging is really cool. I never really blogged until reading Ragamuffinsoul and deciding that I could actually have a voice in this arena. Carlos is a great guy and just as authentic in person as he is on his blog. This is a picture of me playing “fan boy” ….”hey. can I get a picture”. I alos briefly met Heather & the kids in the lobby at Buckhead and said a quick hi….but then backed off in effort to not Freak her out. She was totally cool…I think she is used to strangers yelling out her name then saying…hey, I’m one of Carlos’s blogging friends. Yesterday Brenda & I went to the 9AM at Buckhead. Great opener. 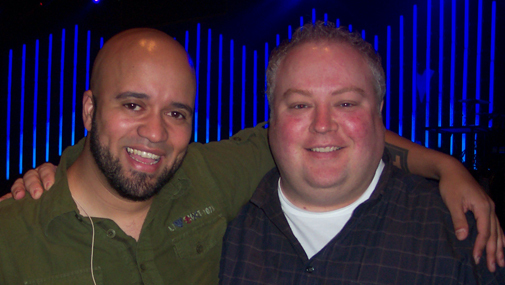 Carlos did the welcome – Christina Fincher did worship and Andy brought it. A couple things I can recall from the message. “Have you ever spent the night dreading what was to come the next day”? Andy was relating how Jesus not only spent the night dreading the next day….his best friends who he poured his life into fell asleep, ran off, & denied him. Andy did a great job helping the audience connect with this point. As well, he made the point about if something is serious to our kids….it becomes serious to us not because it’s a big deal to us but because it’s a big deal to our kids. Again, well presented. Finished the morning at Buckhead with Brenda & Tiffany chatting it up for a while. Then, off to our Sunday adventure….more to come…. What were some of the cool points from the message you heard or delivered yesterday?